What’s your favorite thing about mashed potatoes? All that cream and butter smashed in, right? So, what’s your favorite thing about loaded baked potatoes? All that deliciousness piled on top. Bacon, cheese, sour cream, butter, chives … the list goes on. Now imagine a world where you can have it all. It’s called the twice-baked potato. Good lord, get me a fork. When potatoes are done allow them to cool for 10 minutes. Slice potatoes in half lengthwise and scoop the flesh into a large bowl; save skins. 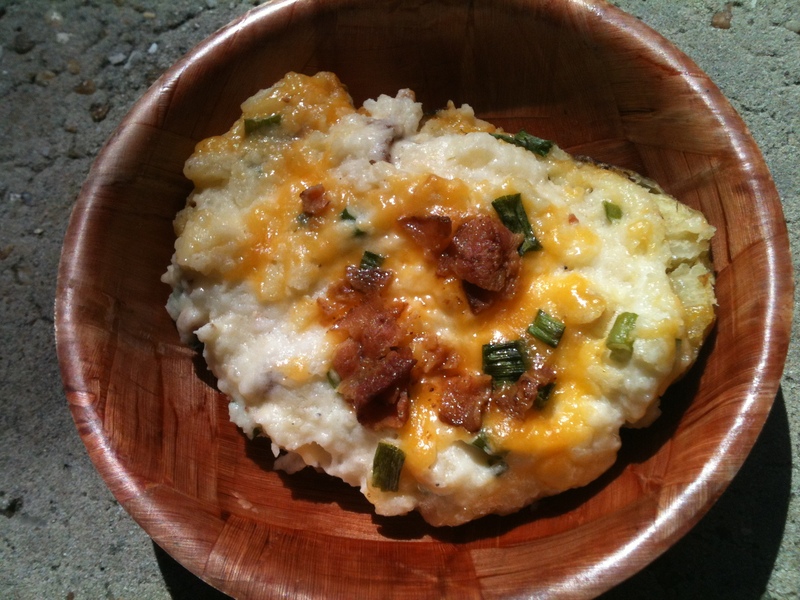 To the potato flesh add sour cream, ranch, milk, butter, salt, pepper, 1/2 cup cheese and 1/2 the green onions. Mix with a hand mixer until well blended and creamy. Spoon the mixture into the potato skins. Top each with remaining cheese, green onions and bacon. This entry was posted on Friday, April 20th, 2012 at 6:05 pm and is filed under Sides. You can follow any responses to this entry through the RSS 2.0 feed. You can leave a response, or trackback from your own site. Yummy! I’ve been wanting to make twice baked potatoes forever now. These look mouth-watering! Thanks, I’m a firm believer that you can’t go wrong with a chock full of sour cream, butter, bacon and cheese! ;) Let me know how you like it! I love twice baked potatoes…adding the ranch dressing adds another nice flavor.